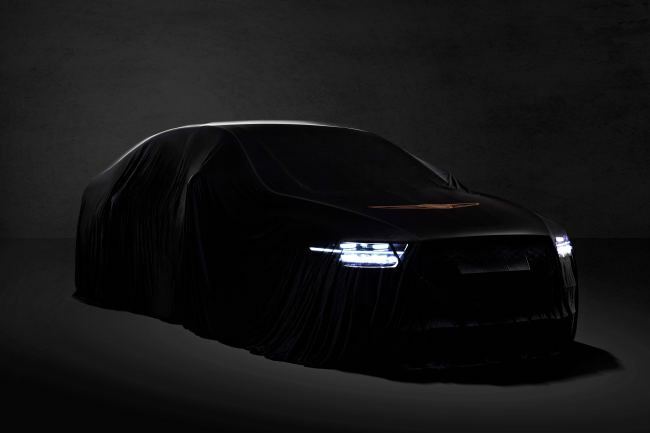 High-end auto brand Genesis unveiled a teaser image of its flagship sedan G90, boasting a new look, with plans to begin sales here later this month and overseas next year, the company said Wednesday. Through the face-lifted G90, Genesis is hoping to accentuate the brand’s luxury identity and step up global sales, for which it will launch the sedan in North America next year followed by other regions. The G90, first released in 2015, completes the Genesis sedan lineup consisting of the G70 and G80, while a sport utility vehicle is scheduled for next year. In the local market, the vehicle previously sold as the EQ900 here will be sold as the G90, signaling the completion of the Genesis brand. The EQ900 was widely perceived as a “CEO’s car” as it had been purchased and used mostly as company cars for corporate heads, including Samsung Electronics Vice Chairman Lee Jae-yong. “The G90 has been reborn with cutting-edge technology and revamped in terms of design, convenience, safety and driving performance,” the company said. Targeting the luxury auto market and rivaling the Mercedes-Benz S-class and BMW 7-Series, the sedan is back with a revamped exterior and interior design. Among the changes in design, Genesis highlighted its “athletic elegance” portrayed through “horizontal architecture” for improved stability and an exclusive character, and Genesis’ signature G-Matrix pattern applied to the tail lamp and wheel to deliver stronger lines and a voluptuous look. In Korea, presales will begin on Nov. 12 with an official launch later this month, the company said. The 3.8 gasoline model will be priced at 77 million won ($68,935), the 3.3 gasoline at 80.9 million won, and the 5.0 gasoline will begin at 118.7 million won, it added.